Some of you guys may have a gluten allergy. I would like you to know that there were no wheat products used when writing this post on bread, so you should be fine to keep reading. If at some point you do experience dietary issues, fatigue or skin rash...stop reading immediately and contact your doctor. I make REALLY good bread. So does God. He calls it 'daily bread'. It's a catchy name I will have to admit. Mine is simply called 'white bread'. Clearly, my baking skills are no match for God's, but there are three main similarities between my bread & God's bread. 1. They taste really good. Store bought bread that has been mass produced and prepackaged doesn't have much flavor left. Daily bread is full of fresh flavor. He feeds us the best. Always. 2. There are no preservatives. When I make bread it goes bad in a day or two. God's bread is the same. It is for today, because there is another loaf coming. It isn't supposed to be stored or hoarded. I can smile while I toast it and smother it with Nutella because I know there is more coming tomorrow. 3. There are no ingredients on the bag. When you buy bread at the store it tells you exactly what is in it. Fresh bread doesn't have that. It is just bread. God doesn't give you the recipe for provision, He just gives you the provision itself. I'm assuming He knows we would attempt to make our own 'daily bread' if we knew how. I ask God to give me what I need financially, physically, spiritually, emotionally...then I stress out when He provides it. Will this be enough? What if I don't like what is in it? I'm not sure how to ration this? I'm really hungry, but if I eat it all now then I will be hungry tomorrow. Ultimately, I don't trust Him. So often I do not believe that it will be enough. I have an ulcer instead of faith. 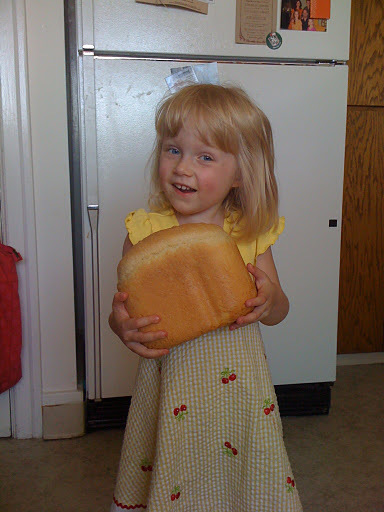 Now if my point ends with "But just like me, God is faithful to make fresh bread every day." then we would all be doomed. Sadly, I am not the most consistent person with routines (I'm an ENTP, okay?). But GOD is always working on the next batch of bread for us. He knows where my emotions will be tomorrow morning and He is baking a bread that will meet my needs at that very moment ( I hope it is a cinnamon roll). I don't know what you need tomorrow morning when you wake up. God does. When your groggy eyes pry open to turn off your alarm, God will be waiting for you with a fresh pastry that is beyond yummy. It will be the exact ingredients, the correct portion, and the burst of flavor that you needed that day. Eat every bite of it because there will be more coming the next day. Don't limit the amount of God you take in. If you aren't full it is because you stopped eating, not because God stopped feeding.